England will need one of their batsman to be a “hero” if they are to win the second Test against West Indies, says fast bowler Stuart Broad. The hosts reached 272-6 on day two in Antigua, 85 ahead of England, who were bowled out for 187 on Thursday. “We need someone to be a bit of a hero with the bat to get us to a competitive total,” Broad told Sky Sports. England are 1-0 down after a 381-run defeat in the first Test, meaning a poor third day could effectively end their hopes of winning the three-Test series. Former captain Alastair Cook said England’s batsmen must be willing to put their “bodies on the line” when they bat again at the Sir Vivian Richards Stadium. “It’s going to be a really, really tough day for England again,” Cook told the BBC Test Match Special podcast. “They are going to have to bat very, very well. On Friday, with the pitch showing increasing signs of variable bounce, the hard work of the England bowlers arguably deserved more than the six wickets they collected. England dropped three catches – Jos Buttler two and Rory Burns one – and, according to Broad, the West Indies batsmen played and missed 103 times. However, West Indies’ batsmen also showed admirable application, none more so than Darren Bravo, who is 33 not out from 165 balls and more than four hours at the crease. 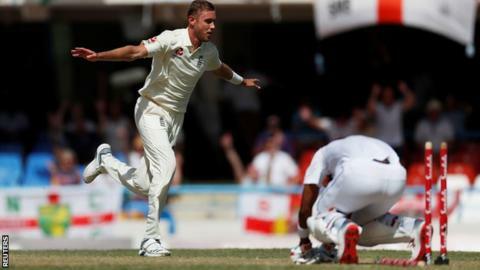 “I don’t think we got the rewards,” Broad, who took 3-42 on his return to the side, told the BBC Test Match Special podcast. “But if you look back at our last six or seven months of cricket, we beat India 4-1 at home when we won every toss and got the rub of the green. “In Sri Lanka, we won every toss and won the series 3-0. It took a huge amount of skill, but the cricket was going our way.